Artboost is the first crowd-curated marketplace for art. Create an unlimited gallery and join a community of more than 5,000 artists worldwide. Manage a professional online gallery with advanced tools for free or set up your own custom shop for a low monthly fee. With either plan, you get a free unlimited gallery on the Artboost marketplace with just 15% commission. 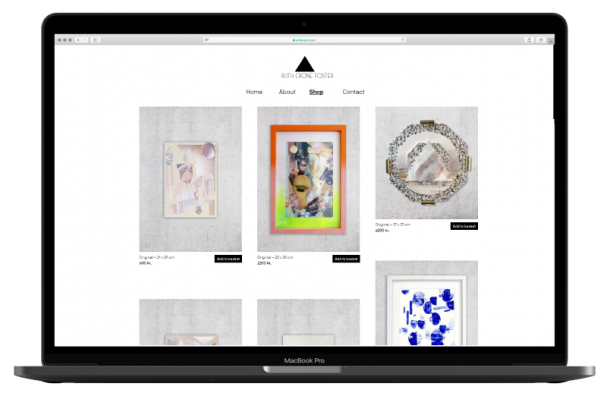 With a custom shop you can mirror your marketplace gallery on your personal website and start a professional custom webshop with just a few clicks. that drive up prices and make art inaccessible. "Artboost has helped me reach a greater audience, to sell my art pieces to priviate customers as well as businesses. They’ve managed to push my art and give me the freedom and time to do what I love – create art!" "Artboost has allowed me to sell my art internationally. Furthermore they’ve created an interview with me that gave me a lot of exposure and has led to people coming to visit me when they’re in town." "Artboost has helped me launch promote and sell limited editions of my original works making them more accessible for people who can’t afford the originals." Is it true you also help to get commission work? Get an Artboost gallery for free. No credit card required. An Artboost gallery is 100% free. Forever. Send me email updates, news and relevant information related to my account on Artboost. I accept Artboost terms and conditions and trust Artboost to safely store and process my provided data. I am 13 years or older. Artboost Custom Shop is a subscription that is paid monthly in full, or annually at a discounted rate. We are working hard on getting custom shops ready for the grand opening at the end of the month. Fill in the form below to pre-sign up for a custom shop and get your first month for free! We will let you know when we are ready to launch.